The image below shows somebody playing MLB 12 The Show for the Playstation Vita. The visuals look pretty good, since I have never played MLB I don't know how the visuals stack up against the PS3 version, but im told the textures are almost as good as its console counterpart. 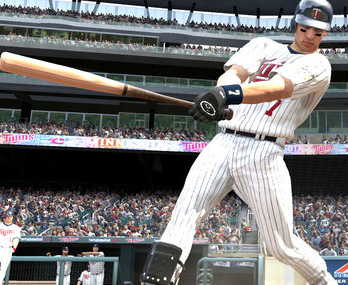 According to an interview from GamerLiveTV, MLB 12: The Show on PS Vita is “comparable” to the PlayStation 3 version. “From a visual perspective obviously we can’t get it to look as good as the PS3,” admitted developer Ramone Russell. “We think it’s comparable,” he added. More importantly, it should be noted that EVERY feature in the PS3 version of The Show is in the Vita’s version. Will you be picking up MLB for the PS Vita? and what are your thoughts on developers shortening the "interval time" for PS Vita games? Let us know in the comments below!